Now a days it is very much important in every part of India to make neat and clean place. In this ''Swachh Bharat Abhiyan'' Indian Oil Corporation Limited, Amritsar (IOCL) has committed to contribute lot of efforts and activities to make successful this Swachh Bharat Abhiyan programme. An example has been put before us by his excellency the Prime Minister Sh. Narendra Modi and following his action for Swachh Bharat most of the dignitaries and Societies, Trust, Ministerial Staff, Individuals are encouraged to take part in 'Swachh Bharat Abhiyan' as this Swachh Abhiyan is very much required from the High-Genic point of view as well as beautification of India. One must be committed to participate in this Swachh Abhiyan as the example has been put forward by Mr. Neeraj Marwaha Manager (IB) Amritsar, SA and other officials (IOCL) Viz. Sh. 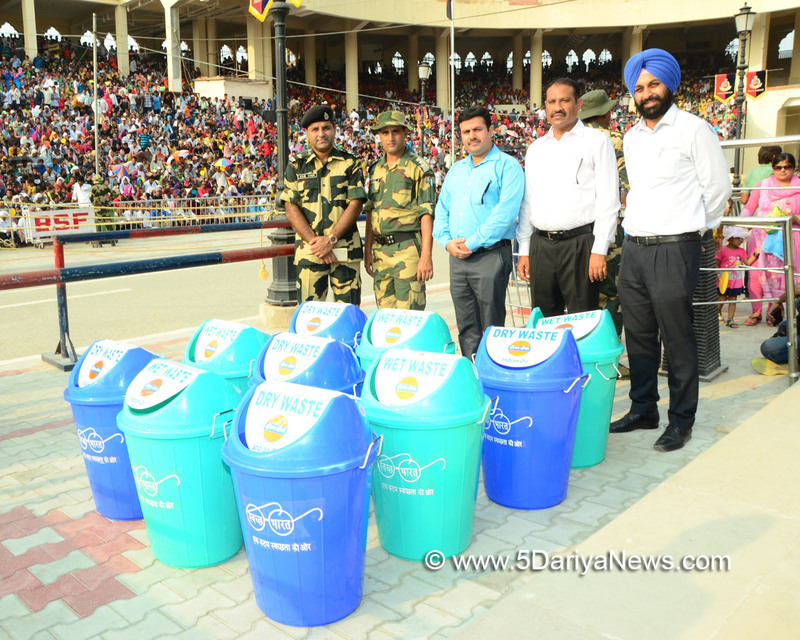 Kapil Bhat (CDIBM) CDO, S. Jaspal Singh Sra Manager (IB) Bathinda, SA and Dealers Sarabjit Singh, Damanjeet Singh and they provided 10 big dustbins to put litter in these dustbins. In associated with Border Security Force (BSF) officials Sh. J.S Oberai DIG (Khassa) Sh. Ayub Khan Deputy Commandant (Khassa) Sh. Nilin (Commandant) Attari Border and big gathering of General Public at Wagah Border at Amritsar. During this event 'Indian Oil Corporation Limited officers along with Border Security Force officers and General Public approximately 20000 persons took an Oath to Contribute their share in 'Swachh Bharat Abhiyan' to urge others to be helpful, Coperative in 'Swachh Bharat Abhiyan' programme. The Indian Oil Corporation Limited officers during the course of this event told to the huge gathering there that prior to this 'Swachh Bharat Abhiyan' event at Wagah Border Amritsar, they have already conducted such like activities on Filling Stations, Railway Stations, Bus Stands and schools, Collages and so many public places to bring awareness amongst the Citizens all over India. Indian Oil Corporation Limited officers appealed to the Citizens of India let their Contribution in 'Swachh Bharat Abhiyan' be positively effective in the matter.